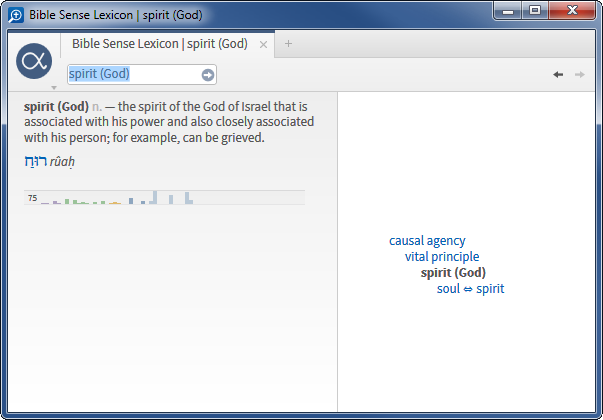 One new feature in Logos 5 that shows up in the Tool menu is the "Bible Sense Lexicon." (It also is available through the Exegetical Guide for a passage in the "Word by Word" section, by right clicking on words in reverse-interlinear coded texts, and in the Bible Word Study about which I say more below.) It is part of a very ambitious project that seeks to organize words used in the Bible according to their function and relationship to similar words or concepts. In effect, it is similar to what Louw-Nida did in the Lexicon of the NT based on Semantic Domains, but this project covers both Hebrew and Greek. We again see that a lot of human-hours has been spent going through the biblical text and assigning words to their various sense categories. I really can't do better explaining this feature than what Logos has on their web site, so be sure to look at this page on the Bible Sense Lexicon. I will simply make some observations and raise some questions and concerns here. There is a hierarchy of listings, and you can move up/down the hierarchy by clicking on the word or concept above/below the one you are looking at. Such a hierarchy is useful for seeing the relationship between concepts. It would, however, be helpful to be able to see the overall outline of how this lexicon is organized. (I'm thinking of something like the domain list structure in Louw-Nida.) "Entity" is one top level category and has six sublevel categories which branch out further from there, but I can't even find what are the other top level categories. As you work down through the levels, the higher ones disappear from the display, so I find that I do a lot of back/forth in the levels trying to keep straight where I am. You can search for words in Hebrew, Greek, or English and will be provided with suggested results (and you need to choose one of those results) as you type. This tool is useful for helping us realize that words do indeed have specific senses. You cannot simply claim that because a word can have the sense of "x" in one passage that it can have the sense of "x" in any passage. As far as I can tell, you can only have one Bible Sense Lexicon window open. It can be helpful for seeing how a certain concept is expressed using Hebrew, Greek, or English. That said, there are still some aspects of it that confuse me. E.g., there is an entry for "lamb" under "livestock" > "young livestock" for which six Hebrew words are provided and three further sub-senses: "ewe lamb," "nursing lamb," "ram lamb." I was expecting to find the Greek word most often used for "lamb" (ἀρνίον) here, but it is listed under "livestock" > "sheep" > "lamb (year old)" with two further sub-senses of "Passover lamb" and "young lamb." For "Passover lamb," πάσχα is given for the Greek (the word used in the NT), but it doesn't connect to the πρόβατον used to designate that lamb in Exodus 12:3, and neither of them connect to the Hebrew word used for the animal in Exodus 12:3, a שֶׂה which is found under "livestock" > "small livestock" > "young small livestock." So, I'm not clear about the organizing principles, and it will still be important to work with the Hebrew/Greek collation done in Emanuel Tov's The Parallel Aligned Hebrew-Aramaic and Greek Texts of Jewish Scripture or, even better, the LXX or Hebrew Translation feature in the Bible Word Study. As you can see in the graphic below, a word like πνεῦμα which has a wide possible range of meanings does get sorted out into its various senses. Still, there are limitations to what it does. E.g., I can't find an entry where the Hebrew רוּחַ is directly connected to that Greek πνεῦμα. You can find רוּחַ under "causal agency" > "vital principle" > "spirit (God)" for which their is a sub-sense "soul <=> spirit." It's under that latter sub-sense that you find πνεῦμα, where a definition is supplied: "the soul understood especially according to its composition: being made of a transcendental, immaterial substance known as spirit." Okay, so that's a hard word to define under any circumstance, but I don't see how it fits under this particular category. Not to look gift horse in the mouth (consider the 'senses' needed to clarify that phrase! ), but this remains a work in progress, and there are many subjective choices which invariably had to be made. It's useful, but you will want to use it with some caution and awareness of other ways to come at a word's meaning and its relationship to its Hebrew/Greek/English counterparts. The Bible Word Study has been expanded with three new sections: Root (which connects the word you are studying with its root and all the related forms with their occurrences; cf. 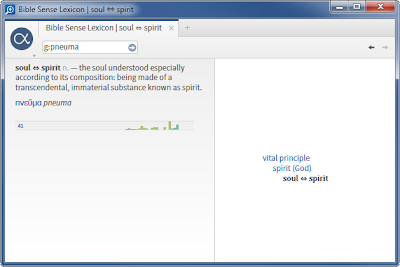 my previous post), Senses (which ties in to the Bible Sense Lexicon; cf. above), and Phrases (which ties in to the Topic guide if there is an entry connected to that word). The Phrases section might not return the results for which you were hoping. E.g., a search on πίστις does not return results for the thorny issue of the "faith in Jesus / faithfulness of Jesus" phrase but instead points to Topic Guides on "Fight of Faith" and "Proportion of faith, Measure of faith." Again we see Logos working hard at integrating its various resources. Many of you are probably aware of the major issue in Pauline studies related to the πίστεως Ἰησοῦ phrase which occurs here in Romans 3:22 and again in verse 26. The issue revolves around how "Jesus" in the genitive case is to be construed. It is a syntactical issue, and the usual way of laying out the options is as an objective genitive which would mean "faith in Jesus" or a subjective genitive which would mean "faithfulness of Jesus." (Take a look at your English versions. Most have a footnote indicating the possible alternative readings.) As you can see, how you take that phrase has significant implications for how we experience the righteousness of God. In the Exegetical Guide to Romans 3:22, the syntactical force enhancement has identified "Jesus" as a qualitative genitive. I find that rather odd, since it would suggest that it means "a Jesus-like faith." Then, just a few verses later when the phrase occurs in 3:26, it's identified as a subjective genitive. That is one of the usual ways of understanding it as I note above, but how you take it in 3:22 should likely be the same way you take it in 3:26. To add to the confusion, it labels it as a subjective genitive in 3:26, but in the Sense definition provided just below it, it links to "trust in the gospel - trust in Jesus as contained in the content of the Gospel" which is the objective genitive reading. Once again, it's great that Logos is working at providing all this additional information and integrating its resources, but we also see the limitations--and perhaps even dangers--of simply relying on Bible software (and I'm not just meaning Logos here) to make definitive claims. The Faithlife Study Bible resources--Infographics, Photos, and Videos--are quite good for the most part. Available in all libraries, I think they will be widely used. The Logos Bible Photos, also part of all the libraries, are collected from the Internet, and are generally of good quality and usefulness. They are public domain images and thus can be used without restriction. The Theological Lexicon of the Old Testament (Jenni & Westermann) and the Theological Lexicon of the New Testament (Spicq) are part of all but the Starter library. The Lexham Analytical Lexicon of the Septuagint (comes in all but the Starter library) mainly provides glosses, so it does not replace the Lust/Eynikel/Hauspie lexicon, but it is a good start. Reverse interlinears have now been integrated totally into the Bible versions. This is really the way they should be done, but note that only the following texts have this coding thoroughly worked out. Rahlf's Septuagint: This is actually a Greek-Hebrew reverse interlinear and provides the basis for linking the Masoretic Text and the Septuagint as well as to English. The information window provides a lot of information quickly. Depending on the resource, you will get: definition, pronunciation, translation, analysis, lexical help. You do need to be working with Hebrew/Greek/English versions of the Bible that have reverse interlinear codings. Even so, there will be some discrepancies due to the English correspondences. The LEB looks to be most distinctly coded to the underlying original language, but with the other English versions you may, for example, get a link to the article that precedes the noun. It really helps to have a wide-screen monitor. Even better, two wide-screen monitors! The color scheme is attractive enough, but I don't see any way to customize it beyond what you can do with Windows system personalization. I was using Logos 4 on an old Pentium 4, WinXP system, and it was pretty slow. I'm now using Logos 5 on a 3rd generation i7 system with 12GB RAM and Win7. That's a pretty fast system, and I can't make a direct comparison of speed between Logos 4 and 5. On my new system, running Logos 5 really does not give me any annoying delays at all. It's very nice working with it. The "Library" packages that Logos offers continue to evolve, and it is a bit confusing. This page provides some explanation, but basically a particular Logos 4 library is not the same as its Logos 5 counterpart. The best thing to do is to go to the Logos site, log in, and use the Custom Upgrade Discount Calculator to see what products are new in Logos 5, which would be new to you, and how big your discount is. I'm disappointed that the "Original Language Library" that I used to recommend to my students is gone. It appears that the Bronze is its substitute, but that looks like a big jump in price (though I can't really tell the exact price, and it would further depend on available discounts). For now, if you want to move to Logos 5, you need to upgrade your Library. This will likely cost you some hundreds of dollars. In the near future, Logos has affirmed that they will offer a minimal "cross-grade" that will be cheaper (under $100) and add features without adding all the new resources. They will also offer a free engine upgrade, but you won't be able to get all new features. Read HERE for more info from Logos' Bob Pritchett. Logos 5 is a significant upgrade whose new features and databases show a commendable commitment to helping the user work with the biblical texts and secondary resources by even deeper integration of all its materials. It is not a huge jump like moving from Logos 3 to Logos 4 was, but that does mean that the user is not confronted with needing to relearn how to use the program. In Part 1 I highlighted some nice updates, and in Part 2 and above on this page, I indicated the main reasons for updating. As I have indicated, there are pros and cons to some of the features. A person should not assume that Logos 5 is the last word on any topic or grammatical matter, but Logos 5 certainly does provide a strong foundation for gathering the relevant data. I am also sure that Logos will continue to improve their datasets and analyses, and for now, it is exciting to see how all these are being integrated and presented. So, if you read this far, you are probably wondering if I am recommending that you buy or upgrade to Logos 5. My response: I don't know, and I'm not sure. I don't know because it really depends on what you want your Bible software to do. 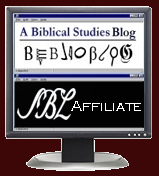 If you do not have any program and are simply looking for an electronic way to read the biblical texts and have some resources available, you can get by with fine free programs like The Word, e-Sword, or LaParola or an online site like the NET Bible Learning Environment. If you are willing to pay some money for particular resources, you can build up a Bible study library with programs like OliveTree's Bible Reader or Laridian's PocketBible. 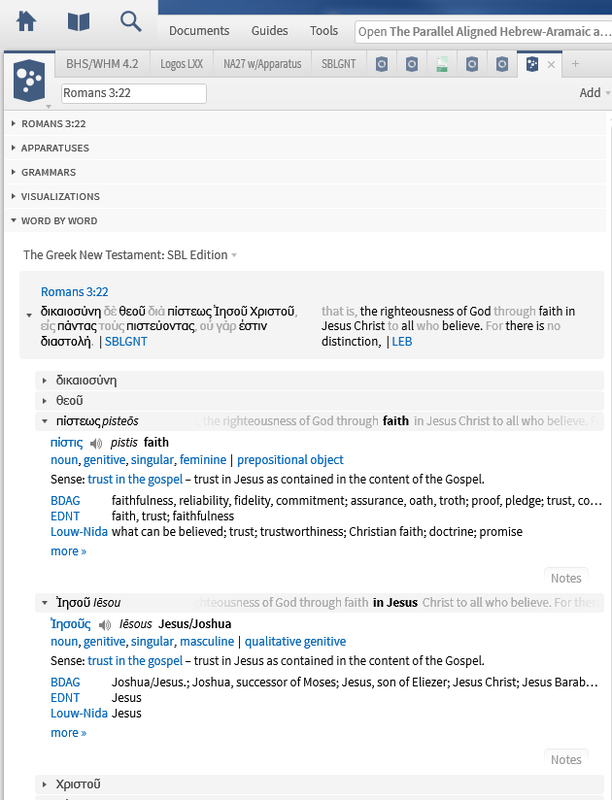 If your interest is primarily in the biblical texts with connections out to important textual, lexical, and grammatical resources, BibleWorks is an outstanding value. (Accordance should also be mentioned here, but I am not a Mac user and have not kept up with all its developments. My sense from taking the 'tour' linked on their home page is that it is similar to Logos 5 for Mac, and I can report that all my students who use Accordance love it.) Logos 5 is primarily a library management tool that is particularly designed for Bible study. If BibleWorks starts with biblical text and links out to resources, Logos starts with a library and delves deeply into the biblical text. Logos 5 shows how well the integration of biblical text and resources can be implemented. It's a premium Bible study program, but you should expect to pay a premium price for it, even with discounts. That is why I'm a bit unsure on what to recommend to you. Personally, for me to upgrade one level from Gold 4 to Platinum 5 would cost over $400, and there are only a couple of the 300 or so extra books that interest me. If an upgrade turns out to be too much money for you also, then you might consider waiting until Logos rolls out the crossgrades. If they are indeed less than $100, I would think it's a very reasonable upgrade. (Look especially at all the Lexham resources you gain, all the resources listed under "Bible Reference," ones in the "Maps, Photos, and Media" group, and the new "Data Sets.") Also keep in mind that buying a Logos library also means it's available to you on your mobile device. As for what I will recommend to my seminary students, I still stand by my observations I made a couple months ago explaining why we have mainly ended up using BibleWorks. As for myself, I am very pleased with what Logos 5 offers, and I anticipate I will be using this new version much more than I used Logos 4. It's intuitive, attractive, provides easy linking to the kinds of information and excellent resources I want, and now with this version 5, provides some analyses of the biblical text that no other program can do. 1: Regarding the Lexham English Septuagint, I was one of a group: Ken Penner, Israel Loken, Michael Aubrey and Isaiah Hoogendyk all did excellent work on the project. The primary reason there is no reverse interlinear is because the Septuagint is large. Big. Massive, even. That is something we would hope to do in the future. No promises, though. We have some other reverse interlinear alignments to focus on first. 2: Glad you like the Apostolic Fathers. It is much smaller than the LXX (honestly, 1/10th the size by word count) so the reverse interlinear was easy. Note you use "Lexham" applied to the Apostolic Fathers. We (Logos) pretty much use the "Lexham" imprint/name for Bibles and biblical reference material. I have seen "Lexham" applied to my Apostolic Fathers stuff on some pages even on the Logos web site, I'm hoping to get that addressed soon. Thanks for your enthusiasm on these works; I appreciate it. I'm sure the other Lexham Engish Septuagint editors do as well. Thanks for the clarifications, Rick. I changed the description of the Lexham English Septuagint (LES) to include the Logos team more broadly. Oddly, I cannot find the LES listed on the Logos site anywhere. I must have just stumbled upon it in the program. Your Apostolic Fathers is indeed listed as "Lexham Apostolic Fathers Reverse Interlinear" on the main Logos base packages comparison page. I hope to visit with you at SBL! No worries, Mark. I won't be at SBL this year. My wife and I are in the midst of adopting, and it is best if I stay home this year. Maybe next year! I've noticed the LES coming and going on the site too. Strangely, if I do comparisons, after awhile it shows up. I think this has been mentioned in our forums, so I'm guessing our web team is on it. Thanks for the review, Mark. One minor correction, the data from the Septuagint Translation feature of the Bible Word Study comes from the Logos Septuagint with Morphology, not from Tov's Aligned Texts. The differences between the two works were recently discussed on the Logos forums, if that's helpful. Thanks, Mark! I updated that sentence to clarify the matter. Those translation 'wheels' in the Bible Word Study are very helpful. I truly think that BibleWorks makes student and non-student users do more work and either have a working knowledge or growing knowledge of the original languages to be most beneficial. BibleWorks is a great product at a great value. Logos and Accordance to some degree have made it easier to get to to the underlying original language texts. Perhaps this is not best in an academic and scholarly environment, but for many pastors and bible students it is very beneficial. In addition the ability to have access to all your library on mobile and tablet devices at no additional cost is very appealing. We are blessed with a great array of bible software products. Thanks for the in depth review.